The special effects are amazing, and I enjoyed the way the film pokes fun at theme parks everywhere – the splash zone at the mosasaur exhibit, the bored teenager running the gyroscope ride, the restaurants and shops with dinosaurs splashed on every conceivable object. But compared to Jurassic Park, Jurassic World is just… soulless. Don’t get me wrong. 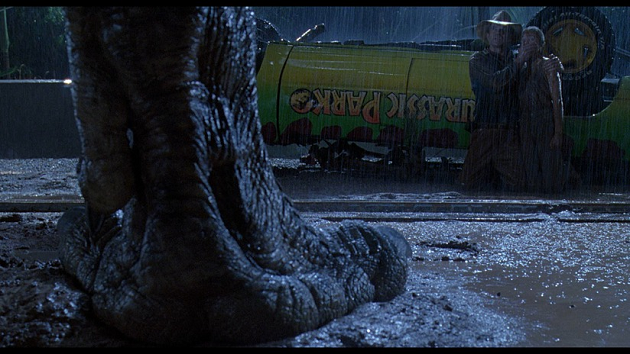 Jurassic Park had its flaws, most notably (to me at least), this one. But Jurassic Park was about something. It tapped into our childhood fascination with dinosaurs and showed us the joy and wonder we’d experience if they still existed. It asked hard questions about the morality of scientific progress, with real discussion of the answers. It had deep characterization, even of secondary characters, and it allowed scientists to be the heroes – to use their knowledge and their courage to find a way to survive when everything goes wrong. It was also completely terrifying. In comparison, Jurassic World is a slick and shallow monster flick. It’s two hours of thrills and chills, provided you don’t think too hard about the science, or even the logic of the plot. And unlike Jurassic Park, which I purchased on VHS and then on DVD, and re-watch about once a year despite its flaws, Jurassic World is forgettable – a fluffy summer diversion with no lasting impact. Did you see Jurassic World? What did you think of it? If you’re interested in the opinions of paleontologists, click here or here or here. 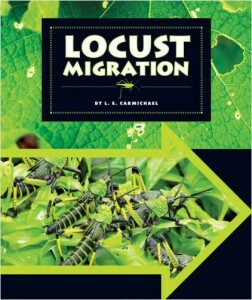 I’ve never written a dinosaur book, but since the dino DNA in the Jurassic Park films comes from insects preserved in amber, I give you my bug book, Locust Migration, for ages 6-9. Recommended for kids who like their science a bit on the gross side! Without the charm of Chris Pratt – I don’t think I would have even seen the movie. Chris Pratt was pretty adorable. Although I preferred him in the interviews to the actual movie! I did love the movie – out of the sequels, I honestly think it was the best one because MAN I jumped a couple times, and the dino fight…the dino fight….. I think they tried really hard. I’m not quite sure anything will touch the original movie due to nostalgia and just some very solid writing (if you ignore the handwavium when it came to science..) but the thing that got me, the soullessness… and I don’t want to go on too much of a rant here… were the women. They tried. She ran in those heels like a BOSS, surprising Pratt’s character as she took off. But the goofy smiles to “your boyfriend’s awesome!” and the cheesiest ending line I’ve heard in a while with her shyly ducking her head and walking alongside him LITERALLY OFF INTO THE SUNSET…augh. Gimme more raptors any day. Ah, the running in heels…. I’d have broken both ankles and had to be dragged out. Totally with you on her character. She had some, and then a man arrived and she lost it. Granted, he’s a very cute man, but still. You don’t get to be a woman in that position without having a spark of your own.